Talk about living in anxious times! Finding this wonderful book by this trusted Christian author was a real treat for me the other day. Many years ago, when I was a new wife and mother to be, a lady at our Bible Baptist church stood up at our young mother’s class and give a book review of another book by Linda Dillow. (That one was called Creative Counterpart,and it was my first taste of the concept of the wife’s role of godly submission to her husband.) Since then, I have been blessed to know other godly ladies who have helped teach me my Biblical role as wife and mother, and I view Mrs. Dillow as one of the pioneers of the movement. Linda Dillow is a mother, a grandmother, the wife of a theologian (Dr. Jody Dillow- Grace School of Theology) and missionary who spent time behind the Iron Curtain with her husband and family when Communism was still the mode of government in Poland and Romania. She and her family risked their lives to teach people who had so little by American standards. But in many ways they were richer than us, because they knew that all they needed was Jesus. 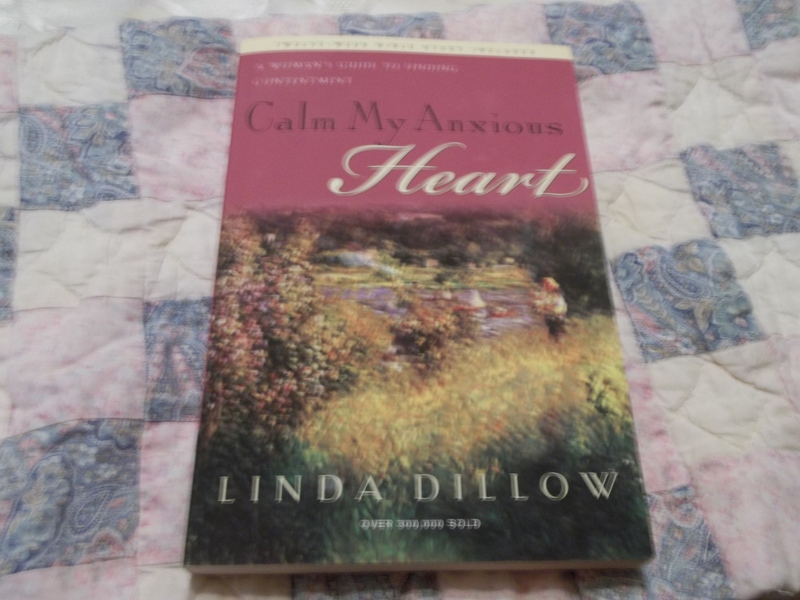 I am guessing Linda Dillow wrote this book because she knew of our tendency as women to worry. If you know me, one of my biggest challenges in life is overcoming my tendency to worry and become anxious about things. The one thing about worry is that once you give in to one thing it seems to give way to five more things to worry and fret about. It can debilitate your entire life. It has mine at times in the past. That is why I am so glad that Scripture tells us in Philippians 4 that we don’t have to worry about even one thing. But the only way we can do that is if we get to know our God and how trustworthy and reliable He is, and bring every worry and concern to Him constantly. This book gives practical encouragement from her own life and how God got her through many dangerous and tremendous trials with her children and facing dangers as a missionary, tests with misunderstandings with others, staying underground from the Communist government while ministering in Eastern Europe, etc. As I read the book, I felt like she was a friend chatting with me from her heart to mine. The book includes practical suggestions for dealing with “what if” thoughts and “if only” thoughts. Those are just the kind of thoughts that get me caught in the worry game. My copy was originally published in 1998 but updated in 2007. There are 12 chapters in the book and at the end is a study guide that could be used for a small group of women. One thing I really liked about each chapter: at the conclusion of each she gave a character sketch of different women she met while ministering through the years. Some of these women’s testimonies were amazing. I felt deeply convicted after reading that. How easy to forget Him when we have everything. But through the trials we go through, He draws us back to Himself. This book offers wise counsel from an older woman to a younger woman (as in the verses in Titus 2:3-5) on how to grow close to God when situations come that tempt our hearts and minds to become anxious. I highly recommend this book for women of all ages.